The anti-Israel boycott movement just suffered serious setbacks in two key world capitals. British Prime Minister David Cameron’s government last week issued a policy notice that public authorities face “severe penalties” if they boycott Israeli goods. Officially, the order protects all World Trade Organization members. In reality, it’s all about Israel. It declares such boycotts unacceptable unless the British government has itself instituted formal legal sanctions or trade restrictions. In recent years, the Scottish government and town councils in Birmingham and Leicester have ordered or encouraged their suppliers to cease business with Israel. The opposition Labor Party denounced Cameron’s move as an “attack on democracy.” But Canada saw bipartisan support for Monday’s vote on a resolution rejecting the goals of the Boycott, Divestment and Sanctions movement. seems Trudeau means to keep his campaign promise to continue the solidly pro-Israel stance of the man he defeated, Steven Harper. regimes as Saudi Arabia, Iran, Hamas and the Palestinian Authority. 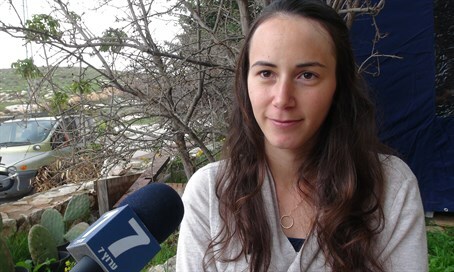 Yael Weissman, the widow of Tuvia Yanai Weissman who was murdered on Thursday in a terror attack by two 14-year-old Arab terrorists at the Rami Levy supermarket in Sha'ar Binyamin, spoke with Arutz Sheva about her ordeal. “It is because of Neta that I have the strength to wake up in the morning and get out of bed and continue. If it wasn’t for her, I would not have the power like I do now,” said Yael. Yael emphasized that she is not authorized to discuss what the army does, but said that Yanai was very frustrated that he had to go on regular leave without his weapon. Head of Tzohar explains the correct way to avoid get refusal, explains how shaming can be used in certain cases as a last resort. Founder and Director of the Tzohar Rabbinic movement Rabbi David Stav told Arutz Sheva about the new protocol published by Tzohar regarding the appropriateness of shaming get (Jewish bill of divorce) refusers online. Rabbi Stav said that the ancient law is applicable today in terms of online shaming. According to Rabbi Stav one must be very careful when choosing to apply the ruling. Rabbi Stav believes that Tzohar’s prenuptial agreement will prevent 90-95% of get refusals that take place following a divorce, as it clearly sets out the financial arrangement that will be enforced should a get not be given, thereby removing it from being used as financial collateral in the case of a divorce. The community already feeling under siege with the rash of robberies and last years murder of Rabbi Raksin is on high alert. 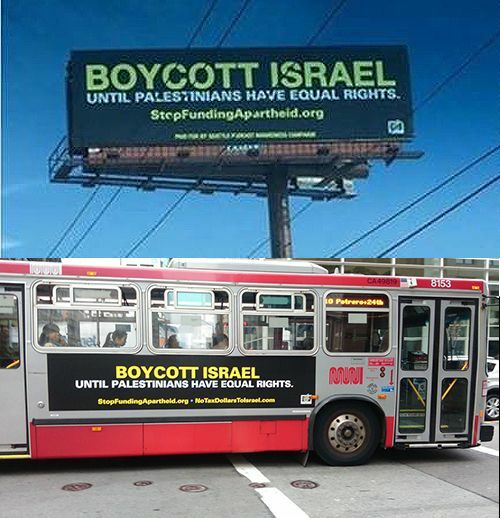 Hundreds of people have expressed outrage over a billboard which calls to "Boycott Israel until Palestinians have equal rights." ZAKA head Yehuda Meshi Zahav criticizes Israeli Medical Ethics Council and doctors who call to treat terrorists before victims. ZAKA head Yehuda Meshi Zahav has come out with strong criticism against the ethical and moral statements that have been expressed by some doctors in Israel. During a medical ethics conference in Jerusalem this evening (Wednesday), Meshi Zahav spoke about the order of treating terrorists and their victims. After a number of doctors expressed their opinions, Meshi Zahav got up on stage and spoke out against those who claimed that seriously injured terrorists should be attended before their victims. "A murderer versus the victim? I am as sharp as a razor and so I also tell the volunteers - first the victims." He continued by saying, "If we treat the murderer and the victim continues bleeding - effectively we're doing what the murderer wanted. Maybe you are taking part in murder because you didn't treat the victim." Meshi Zahav noted that there is a double standard in Israel between public and private medicine. "Whoever has money and is lightly injured gets treated before someone badly injured. We sell our ethics for money so where is the morality? We have stopped listening to the world's false morals. Last week a British soldier from the elite Special Air Service unit used an Israeli made rifle to decapitate an ISIS instructor who was showing new recruits how to behead prisoners. “One minute he was standing there and the next his head had exploded.” reported an eyewitness to the Mirror. The irony of the situation was not lost on the sniper who had to “aim to miss” the intended target in order to hit him, due to the special nature of the bullet fired. The British sniper decapitated the ISIS executioner with a single bullet from a long range rifle, reportedly from a distance of 1,200 meters. The slug used in the execution is often referred to as a “wounding” bullet due to the “tumbling motion” it makes when fired. The resulting effect causes the bullet to cartwheel around inside a body once it hits its victim rather than flying straight through flesh. The effects are devastating. While the bullet is made internationally, the rifle that was used for the incredible shot was created and developed by Israel. The Daily Express quoted an unnamed source who identified the sniper’s weapon as a Dan .338 equipped with a suppressor “which reduces the sound and eliminates any flash from the barrel”. The Dan is an Israeli manufactured sniper rifle that weighs 5.9 kilograms and was created by renowned weapons designer Nehemia Sirkis and Israel Weapons Industries (IWI) in 2014. Israeli news site Mako reported that the gun is sold to police units and militaries around the world and is accurate up to 1,200 meters, a distance that was well used by the SAS sniper. The SAS snipers were on a reconnaissance mission inside ISIS held territory in Syrian, when they received intelligence that a decapitation instructor was demonstrating to new recruits the techniques used in killing prisoners with knives, axes, and swords. One sniper targeted the instructor and took his head off. “The Dan .338 sniper rifle is just the first in a series of advanced sniper rifles which we will be bringing to international markets. The ammunition used in the rifle is exotic and we estimate that the future of sniper rifle ammunition will be 3.38 caliber rounds,” said the Director of IWI Uri Amit. Production of such meat will be supervised by government authorities and export of kosher and halal meat will be banned. The Dutch government said Wednesday that it plans to limit Jewish and Muslim methods of slaughter through new measures, including supervision of the production of kosher and halal meat, and a ban on its export. Agriculture Minister Martijn van Dam announced the plan in a letter to the lower house of the Dutch parliament. JTA reported that production of kosher and halal meat will be subject to the discretion of officials from the Netherlands Food and Consumer Product Safety Authority. This bodes ill for the slaughterers, since the same authority urged the government last year to ban ritual slaughter altogether, claiming it was inhumane. The ban on exports is not particularly significant since Holland does not export significant amounts of kosher meat. In late 2011, the upper house of the Dutch parliament rejected a proposed bill to ban Jewish kosher slaughter of animals on the ground that it violates freedom of religion. Earlier that year, the Dutch parliament voted in favor of the legislation. The bill claimed that there is evidence that the practice of kosher slaughtering causes animals unnecessary pain and suffering. This claim is roundly denied by experts on Jewish slaughter. Following this, the Dutch government reached an agreement with Jewish and Muslim leaders setting certain standards for ritual slaughter, including a 40-second limit on the time between stunning of the animals before their necks are cut. The sides also agreed to hold research-based consultations between government officials and religious community leaders on balancing animal welfare with religious freedoms. Chaim Biton hit private car on Jerusalem-Tel Aviv route a few months ago. Egged paid damages and let him return to the wheel. The reporter Gadi Soknik has published a video of the driver responsible for last week's Highway 1 crash, Chaim Biton. The clip shows that he was involved in another accident between Jerusalem and Tel Aviv several months ago. Biton had struck a private vehicle, without legitimate cause, and could be seen exchanging information with the driver. Egged was forced to compensate the driver to the sum of 15,000 shekels ($3,800 US) and allowed Biton to continue driving. In addition, it was reported that Egged received an evaluation on Biton which warned that he drives unsafely and presents a danger to the public. Egged refused to comment on the recording, as well as to a request for the number of drivers that were involved in traffic accidents and then returned to work. The company claimed that such information would be part of the investigation into the lethal accident that occurred last Wednesday. It should be noted that Biton was involved in an almost identical accident to the most recent one in 2013, on the same strip of the road and under similar circumstances. No one was killed, though 18 people were lightly injured. Biton was released today for 21 days of house arrest. The judge ruled that he will spend the time under complete house arrest in his Jerusalem home, with his mother monitoring him 24 hours per day. The judge further declared that Biton cannot leave the house except for court hearings or police investigations, which must be coordinated with the investigators. His driving license has been revoked until the end of the proceedings and he has been forbidden from leaving the country for the next six months. He also put aside 7,000 shekels ($1,800 US) and signed a personal bond for 10,000 shekels ($2,600 US). 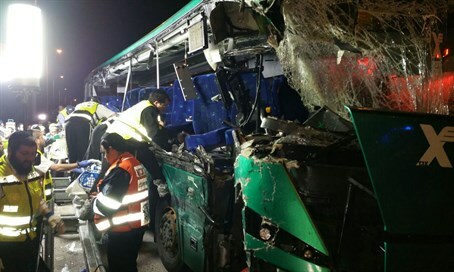 Authorities are looking into the possibility that Biton tampered with the bus's tachograph immediately after the accident in order to obstruct the investigation. The tachograph records a vehicle's speed and distance, along with the driver's activity. Biton admitted that he removed the device from its place, and television cameras caught him speaking with the police investigator who told him, "Don't play games with me." Police are expected to also investigate senior Egged officials on suspicion that they knew of his problematic driving. In formal statement from Jerusalem during visit to Israel, British Minister announces measures banning public bodies from boycotting Israel.As of today, the British government will be enacting measures to prevent public bodies from engaging in or endorsing boycotts of the State of Israel. The measures, announced earlier this week, would make such moves illegal, and represents a serious blow to groups like the so-called BDS Movement, which seek to impose international boycotts and sanctions on Israel. The bill is specifically aimed at preventing local authorities and bodies from being hijacked by anti-Israel extremists to promote radical foreign policy agendas targeting the Jewish state. UK Cabinet Office Minister Matthew Hancock formally announced the commencement of the measures during his visit to Israel Wednesday. "We need to challenge and prevent these divisive town hall boycotts," he said in Jerusalem. "The new guidance on procurement, combined with changes we are making to how pension pots can be invested, will help prevent damaging and counter-productive local foreign policies undermining our national security." An explanatory statement from the British government outlined how the "guidance published today makes clear that procurement boycotts by public authorities are inappropriate, outside where formal legal sanctions, embargoes and restrictions have been put in place by the Government." "Town hall boycotts undermine good community relations, poisoning and polarising debate, weakening integration and fuelling anti-Semitism.," it added, while "locally imposed boycotts can roll back integration as well as hinder Britain’s export trade and harm international relationship." "All contracting authorities will be impacted by this new guidance including Central Government, Executive Agencies, Non Departmental Public Bodies, the wider public sector, Local Authorities and NHS bodies. "Any public body found to be in breach of the regulations could be subject to severe penalties," it said. Explaining the reasoning behind the measures, the statement went on to note that it was merely enforcing compliance with international law - specifically the World Trade Organization Government Procurement Agreement treaty, an international market access agreement which "requires all those countries that have signed up to the Agreement to treat suppliers equally. "This includes the EU and Israel. Any discrimination against Israeli suppliers involving procurements would therefore be in breach of the Agreement." The British government qualified, however, that it did not effect London's "existing policy support for clear and transparent labelling of settlement products to ensure that individual consumers are able to make informed choices before they buy." 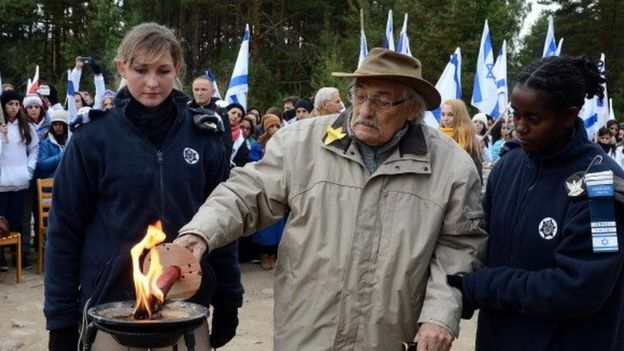 British Jewish leaders have already lauded the move. "Boycotts are an impediment to community relations and sow division and discord, ultimately fuelling antisemitism, so today's announcement is welcome," said Simon Johnson, Chief Executive of the Jewish Leadership Council, on behalf of the Fair Play Campaign Group. "Local councils, universities and other public bodies shouldn't have their own foreign policy. The government’s decision to make this clear emphasises inclusivity over boycotts and coexistence over further divisions. This can only be positive, both within the UK and in the Middle East." She did not intend to become the heretic of the checkout line. But as she watches her food bill skyrocket, Deborah feels compelled to make snarky remarks. "Why bother eatingkosher?" she asks those behind her. The patrons tut-tut in agreement and discuss how expensive kosher food has become, and on top of the "tuition crisis" -- the exorbitant expense of Jewish day schools -- how can anyone afford to shop in Glatt markets? But the reality is: the price of kosher is the least of it. "For the record, most items with a kosher certification are not more expensive," says Menachem Lubinsky, an authority on the kosher food industry, CEO of Lubicom Consulting and Founder of Kosherfest, "What are more costly are the specifically produced kosher foods that require extra kosher certification, particularly in meat and dairy. Prices may be 10 percent to 20 percent higher than non-kosher items." He adds that despite higher fuel and commodity prices in recent times, costs of most kosher ethnic foods have either stayed the same or gone up by no more than 3 percent to 5 percent. Lubinsky's information confirms that the cost of kosher food is nothing when compared to the exorbitance of Jewish day school tuition. Deborah is a young mother who is paying $16,000 per year for one of her children to attend a Jewish day school. She asked that I change her name for this article because, as she phrases it, she feels "priced out" of her religion. However, she's determined to figure out this problem because she loves Judaism, she is spiritually connected to every facet of her Modern Orthodox lifestyle, and she should not have to feel this way about costs. When I ask a tuition-paying friend of mine if she feels stressed by religion, she replies "I don't feel stressed. As a matter of fact, religion is my oasis from stress. The cost of Jewish day school is not a product of our religion, rather a malady of sorts that we as a community need to work together to cure. The Torah tells us that for every illness, the cure is already provided -- we just need to work together to find it." Rabbi Saul Zucker of the Orthodox Union explains that "the average price of Jewish day school tuition for grades K-12 is $15,000 per year (as compared to the average Catholic school tuition of $3,383, according to NCEA). For four children that would mean $60,000 per year post taxes, which indicates that one would have to earn approximately $200,000 per year (the top 3 percent of earners in this country) just to support their children's education." Zucker says that Jewish day schools aim to provide the very best possible education, with fine arts curricula, the newest in technology, stellar guidance counseling services, after school programming and other "frills," but that the model is "unsustainable" in the long run. That is why many are seeking other solutions. Recently, the Shalom Academy (SACS), a Hebrew-immersion charter school, was approved for Englewood and Teaneck, N.J. Some Jewish day school parents have decided that a Hebrew language and culture education (despite it not being a Jewish education) is a great secondary option, and have enrolled their children, who were admitted through a lottery, in SACS for this coming September. Others are outraged that their friends would opt for a "non-Jewish" education, and despite struggling with tuition themselves, they are keeping their kids in yeshiva. Many of them also wonder if they'll ever be able to retire. And that's only elementary school. "If you think you're getting off at only 18k per kid with four kids in high school, I have somebaaad news for you," says my friend Josh Lipowsky, a former Assistant Editor at The Jewish Standard. "One high school that I looked at had a base tuition of more than 22 grand and after all the building fees and the annual dinner fee, it is well over 25k. The application fee alone is about $800. We're talking about New Jersey. Manhattan is a whole other story." In fact, Manhattan Jewish high schools cost significantly more. One in particular, known for its stellar academic and extracurricular provisions, costs over $30,000. "Unlike the public schools, the day schools have to raise the majority of their money, Lipowsky explains. "There is very little available from the state -- a few hundred per student for nurses and books, but that's about it. As for the higher costs, it actually costs, according to Agudah N.J., less to educate a day school student than a public school student, but day school parents get the double whammy of paying for both Jewish and secular studies. Starting in the 1970s, day schools began competing not only with each other but with public schools. In order to attract top teachers, they had to offer comparable salaries and benefits. In order to keep students, they had to start offering other services that the public schools offer -- art, music, clubs. And they also had to keep up with the latest in technology in order to compete. You can look at schools with price tags half of other elementary schools but fewer services. They don't have the same number of guidance counselors or music teachers and rely on parental volunteers for special things to keep costs down." A number of Jewish day schools offer scholarships to families below the middle income bracket, largely based on one's tax returns. Those scholarships are often difficult to obtain and involve a lengthy approval process. It is a wonderful option for those who qualify, but not without risk to the recipients, who report feeling singled out and scrutinized by the rigorous and ongoing investigative process to determine worthiness. One mother told me that she is always eager to volunteer her time to the school and goes above and beyond to do so, but she once received a letter that strongly advised her, "as a scholarship recipient," to man the help desk at an event. Word quickly spread throughout the parent body about the tone of the letter. "The letter was very specifically addressed to scholarship families," she laments, "but someone blabbed, and once the event rolled around, those of us volunteering felt like 'Hey, see us behind the desk? We're the scholarship families.' I didn't really want to be outed in this manner to other parents. Don't get me wrong -- I love to help the school. I just didn't love being singled out as the 'poor woman.'" "I didn't grow up around here," one father of Jewish day school children told me, "I feel it's New York and New Jersey that are so expensive." But those from the tri-state-area are certainly not the only ones feeling the crunch. Naomi Sandberg of Silver Spring, Md., breaks it down for me: "40,000 for two kids in Jewish day school, 5,000+ for two kids in Jewish day camp (who can afford sleep away camp? ), 1,000+ synagogue dues, the high price of kosher food, the high price of housing in 'Jewish neighborhoods,' Passover food, Purim baskets, High Holiday seats, 500 for school or synagogue banquet, donations to school, synagogue and mikveh, no vacations (who could afford to pay for one even if one has the time off? ), no home improvements, except for critical maintenance." When I pose the question "Why don't you just send your kids to public school?" Sandberg says "Day school education immerses kids in Jewish tradition, culture, history and literature. Our kids need to learn not just what we do as Jews -- kashrut, shabbat, mitzvot -- they need to learn why. A good day school education integrates Jewish values and history throughout the curriculum. In P.E., students should be learning the importance of physical fitness, sports skills and good sportsmanship -- being a mensch! When studying American History, they need to be looking at what was going on in the American Jewish community as well." Yitzi Flynn, who I found through the 200K Chump Blog (www.200kchump.blogspot.com) where all sorts of gripes about North Jersey yeshiva tuition are expressed, switched his son from a religious day school to a local public school. He says that his son, who was having difficulty with the fundamentals in reading and comprehension at his former yeshiva, is now thriving in public school. In fact, he recently made honor roll. "The backbone of religiousity and the majority of who the child is comes from the home," Flynn says, explaining that his son prays in the mornings, eats completely kosher, and that teachers and friends' parents bend over backwards to accomodate his religious needs (i.e. kosher food at birthday parties). "200K Chump," who would not reveal his identity via email, says that he started his blog "to give the thousands of families struggling to pay Yeshiva tuition in Bergen County an outlet to come and discuss how the tuition crisis is affecting their lives and to search for real solutions and alternatives to the overpriced legacy yeshiva institutions." He explains that he is an average day school parent paying full tuition and he "got fed-up with the silly band-aid solutions that people in town would talk about which - even if they were successful - would do nothing to lower the cost of tuition and at best would slow the tuition increases." When one administrator told him that despite tuition being unaffordable to the masses, there were no plans to ever lower it, and the best he could hope for was that tuition increases wouldn't outpace the overall rate of inflation, he "knew that we needed to search for real and radical alternatives to these institutions." That is when he began to blog. "As far as reaction, it has been a mixed bag. I have been contacted by so many wonderful supporters who applaud me for my efforts and back me and the blog 100%. However, I also have been threatened, chastised, and called every name in the book. 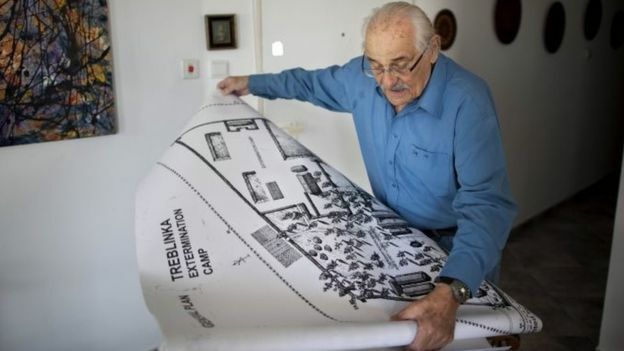 I have been compared to such people as Hitler, Stalin and others." Chump has brought the words "Jewish day school tuition" to the blogosphere in a big way. If you simply input that phrase into google today, his blog and the many reactions (ranging from supportive to skeptical) to his posts are what you'll see first. Many members of the North Jersey orthodox Jewish community who I spoke with admitted to "hating to admit" that they read his blog. Some, active in initiatives to combat the crisis, are avid readers as well. In addition to the Orthodox Union, organizations like UJA Federation and Yeshiva University say they are committed to figuring out a solution to the "tuition crisis." Also, smaller non-profits have formed and are partnering with these larger institutions to help the Jewish day schools. Rabbi Shmuel Goldin of Congregation Ahavath Torah in Englewood, N.J., founded Jewish Education for Generations (JEFG): "We regularly have representatives of eight local North Jersey Jewish day schools meet, review budgets and try to figure out how to get things under control," he explains. One of the first things JEFG did was establish NNJ Kids (Northern New Jersey Kehillot Investing in Jewish Day Schools), a communal fund that raises money for local yeshiva day schools. "We set up a fund to which anyone and everyone from all the synagogues can contribute to offset tuition needs," Goldin explains. "The money is distributed to the schools for the purpose of scholarship funds and it is spread responsibly. The 'tuition crisis' is a problem that will last past the recession and this fund is something we should have begun working on years ago. Individuals have contributed since we begun, but even $1 million, which sounds like a lot, is a drop in the bucket to tackle this problem." He says that JEFG is in the process of creating another fund, similar to an endowment, in which money will be raised for the middle income bracket of people who can not get scholarships but are struggling with tuition payments. Rabbi Goldin calls the tuition situation "overwhelming." Rabbi Zucker says, "There is no magic bullet." Both know there is a long way to go, a lot of work to be done and are committed to ensuring that kids stay in Jewish schools. For her part, Deborah will be sending her older child to Shalom Academy come September, though she is nervous about the social changes involved in switching from a yeshiva to a charter -- not just for her child, who has friends in yeshiva, but for her as she is friendly with their parents. She plans to supplement the Hebrew education her child will receive with daily after-school tutoring in Judaic studies. Socially, the route she has chosen is the "road less traveled by" in her community. "I'm tired of complaining," she says, "Hopefully, this will make all the difference." I saw my ex-husband in court last week. It was the first time I had seen him in longer than I could remember; the exact date lost in an 8-inch-thick legal file of court proceedings that is currently lying on my desk. In fact, I could count on one hand the number of times I have seen him since I started that file four years ago. Up until just a few days ago, I literally could not find my ex-husband. But before he disappeared four years ago, I was a married, stay-at-home mom of a 3-year-old daughter and 7-month-old son. Then overnight my world turned upside down when my husband said he was going to the store and simply never returned. Not only was my marriage over, but he left me with two very young children in a position where I was unable to instantaneously support us. Quitting his job and leaving his work vehicle (his only car) in the parking lot of his employer, he turned off his phone, moved out of town, and became untraceable. His actions were not just an exaggerated statement that he no longer wanted our marriage, but it was a heartbreaking declaration that he also no longer wanted our kids. Except that really, none of that matters. The fact is that I had two children, in a marriage where my husband made it abundantly clear that he wanted me to get pregnant, and then half of the people that it took to create those kids walked away. Despite our circumstances, I still want what’s best for my kids, so I wasted no time in trying to pull a life together for the remaining three of us. Unlike their father, I couldn’t ignore the kids’ heartache, and the last thing I wanted to do was add to their suffering with unmet necessities and hunger, which was at times a reality for us. So thank goodness the kid’s father was legally required to financially provide for us by paying spousal support and child support! Except how do you get money from someone that you can’t find? Emergency motions were filed, temporary support orders were put in place, but at the end of the day all I had was a piece of paper stating that I should be getting money that I had no idea how to actually obtain. I was thrust face first into the reality that real life isn’t like TV, where the court system will hunt your ex down and make him pay, and kind hearted detectives are so worried about your children that they will put in overtime to track down your child’s deadbeat father and throw him in jail with the rest of the nation’s criminals. No, I learned that real life is aggravatingly slow, exceedingly clerical, and unbelievably flooded with many parents who are in the same situation as mine. Unfortunately, I’m no special snowflake. In the U.S., only 42 percent of custodial parents(the parent with physical custody of their children) are paid the full amount of child support that they are owed, leaving more than $21 billion in unpaid support that is owed to single parents like me. When you look at those astronomical amounts that our court systems are trying to deal with, it’s easy to understand why many single parents just become another number on a list and a file on a desk. The judge did however, order my now ex-husband — who was claiming that he was unemployed and could not pay support — to begin what was called a “job diary.” My ex was supposed to apply for two jobs a day, make a record of it, and bring the record to my attorney’s office on a regular basis in order to prove that he was attempting to financially support his unwanted, but still very much existing, children. It didn’t surprise me though when he walked out of court that day and failed to ever show up to my attorney’s office with his job diary. I was not OK with that. It wasn’t even money that I was after per say, but rather the necessities that the money could buy. My ex left me in a bad situation and getting out of it has proven to be financially difficult. We live below the poverty line, and I need things for the kids now, but Target won’t take an “I owe you” and collect my payment in 16 years. The caseworker’s answer was not good enough for me, but unfortunately there wasn’t much I could do about it. As far as I knew, my ex was working under the table somewhere. When the child support department checked his social security number, it reflected no activity that would trace him to a job, an apartment rental, a car payment, or even a credit card. Months dragged on as I watched notices being sent to my house stating that the child support department had suspended his hunting and fishing license, as well as his firearm ownership card. I got a letter stating that if he didn’t start paying, they would suspend his driver’s license. Eventually a letter came that they had suspended his driver’s license. But none of that mattered to me, because what I needed was money and I didn’t have the luxury of waiting. And the irony of it all is that in order to get money, you need money. Slapping down the last of the money I had from selling many of my possessions, I paid my attorney to take my case back to court again in the hopes that I could speed along the process. We went to court, a warrant was issued for my ex’s arrest, and then the waiting process began for someone to stumble across him, or for the police to randomly pull him over. A process that did nothing except shatter any stigmas I believed of how easy it is to have your ex thrown in jail for nonpayment of child support. The jail was ready for him, but not if they couldn’t find him, and with real crime on the police dockets, my ex wasn’t anyone that they were actually looking for. Months later I found out that he was working a part time job across town. Why his social security number hadn’t been flagged in the system, I don’t know, but when I called the police begging them to go pick him up, I was told that they didn’t have time. After calling every day for a week, I broke down into tears, and thankfully, the cop who had answered my call related to the struggling parent I was, and saw me as more than just a file on her desk. My ex was picked up that afternoon, taken to jail, and mere hours later he bailed out with the entire amount of his back due support. He had the money all along, he just didn’t want any of it to go to his children. Unfortunately, he didn’t change his ways, and did not continue to keep current on his support obligations. When the amount he owed our family once again reached a staggering amount, I took him back to court again. Having been served at his place of employment, he did show up to court, only to threaten “if you throw me in jail, I’ll get fired, and then you won’t get any money out of me,” which was it was enough to cause my attorney to remind me of how the law works. The law will send parents to jail for nonpayment, and their only way to get out before serving up to 12 months in some states is to pay the full amount of what they owe. Looking at my ex and heeding my attorney’s words that my ex probably would lose his job, and might not get another one, I begrudgingly signed an agreement that would allow him to repay the debts he owed over the course of the next five years, via a garnishment from his paycheck. I didn’t like it, but I had made the best decision that I could in a situation with no great answer, and it turned out to be the wrong one. My ex quit his job, there was no support to be garnished, and he fell off the grid again. I’ve gone to multiple court dates since then to try and get what my children are owed, but my ex never shows up and I leave with pieces of paper that just add to the clutter on an overwhelmed caseworker’s desk. But then last week my ex surprised me and showed up to a court date for his continued nonpayment. Our case is set for hearing next month, but that doesn’t mean that I will be getting child support, or that I ever will. With the largest percentage of our population’s poverty-stricken families comprised of single parents owed unpaid child support who can’t seem to catch up enough to get ahead, I fear that I may be stuck in this cycle forever. I want to give up, to stop chasing him down, but I have kids who need more than what I can provide them alone. I don’t like living below the poverty line, and I didn’t get into this situation by myself, but the burden of fixing it falls solely on me. My kids and I deserve better than what my ex is doing to us, but as I’ve come to learn, our situation is not something I can easily change. “Just get child support” people say.